The focus of my research is “Creating Health from the Soil Up”. Sustainable agriculture encompasses many aspects of raising food, fiber and fuel products. We must care take our soils, water and air while monitoring impacts of methods of production on agricultural workers and consumers. Ideally, we as a global community should be able to produce high quality, abundant agricultural products which enable humans and animals to thrive from generation to generation without damaging our environment. I felt compelled to study the problems in detail in a university setting and build on the work of other researchers in discovering solutions. Research done with appropriate controls and approved methodology is important for broad acceptance. My research focuses on bridging an understanding from soil health, through plant health to animal and human health. I have been encouraged by various professors and agriculture professionals around our country and the globe who are excited about my research of comparing sustainable organic/biological cultivation systems to conventional systems and testing the effects in humans. My aim is to highlight differences that production management systems have on produce quality, emphasizing nutritional differences and direct effects on human metabolism. For example, field observations and pilot data suggest that human blood glucose responses differ between fruits of the same cultivar grown under these different methods. It is reported that diabetics can eat high quality, biologically-produced fruit without a large glycemic fluctuation, yet the same cultivar conventionally grown causes a spike in blood glucose. What makes these observations even more intriguing is that the biologically-produced fruits typically have a higher percentage of sugars than the conventional counterparts. In addition, the biologically-produced fruits are reported to taste better and have a much longer shelf life. The implications of this research are vast. The underlying principles can be applied to any crop. Healthy soil supports healthy plant growth. An ideal microbial population helps make nutrients available to the plants. Microbes “glue” soil particles together which decreases erosion and toxic run-off, decreases needed inputs, decreases costs, and saves our top soil. The producers will have good land to pass on to their heirs. Selected microbes trap nitrogen from air which decreases nitrogen inputs, decreases costs, and decreases pollution. Microbial activity keeps the soil temperature more constant (warmer in winter, cooler in summer) which equates to longer growing seasons. More stable ground temperatures may also influence the stability of the air temperature over the land. This may equate to less extreme weather patterns, which would bring better farming and living conditions. Currently, due to extreme weather patterns, some producers are feeling forced to expend large sums of money for greenhouses to protect their crops. Selected microbes clean up toxic conditions, such as “chemically-burned” fields. Microbes and earthworms recycle nutrients in the soil and improve soil tilth. Beneficial microbes and soil organic matter help modulate soil moisture content allowing crops to better withstand fluctuations in moisture. Insects are less attracted to the plants, so fewer pesticides are needed. This equates to less expense, decreased crop losses, decreased environmental pollution (air, water, soil), and fewer health risks for agricultural workers. Pesticide-free produce may also bring premium prices. Plants are more disease and pest resistant, so fewer sprays will be needed. Again, less expense, decreased crop losses, decreased pollution, and fewer health risks, along with possible premiums. Plants may realize their genetic potential with increased yields (increased profits) and higher quality produce (which brings premiums for the producers, sometimes huge premiums). High antioxidant and nutrient density which makes it healthful and satisfying. An exceptionally long shelf life which decreases losses for producers, packers, shippers, and consumers. Superior taste and sensory appeal, which increases consumer demand and, again, brings premium prices. Healthier, happier animals resulting in decreased need for medication and decreased losses. Healthier animal food products for consumers. Improved food flavor and satisfaction. Better-tasting produce may increase consumption of fruits and vegetables, which may in turn equate to better health. Decreased levels of harmful agricultural chemicals means decreased toxins in food and the environment. Longer shelf life leading to decreased losses after purchasing foods. Full-spectrum nutrition equates to better health. This decreases healthcare costs while increasing human productivity and quality of life. I see this as a win-win-win-win situation—for producers, animals, human consumers, and the environment. Already, in several parts of the world, some producers are “nutrition farming” and contracting with grocery stores to market their superior products to grateful consumers. My vision is that more educators will share vital crop-improvement information in an effective manner to many producers, who will in turn supply improved nutrition within a sustainable context, making a positive impact on the health of a multitude of people and animals. Problem: Scientific studies show the nutrient density of fruits and vegetables has significantly decreased since 1940, with nutrient losses as high as 81%. Solution: Grow and consume Nutrient-RichTM produce. Think of the possibilities! What if one could select and grow a variety of food plants with genetics that produce maximum nutrition, such as vitamins, minerals and antioxidants? Then, what if one could give these plants everything they need to be able to express their genetic potentials? Wow! We could have some truly great food! Fortunately, this work is beginning to be done. 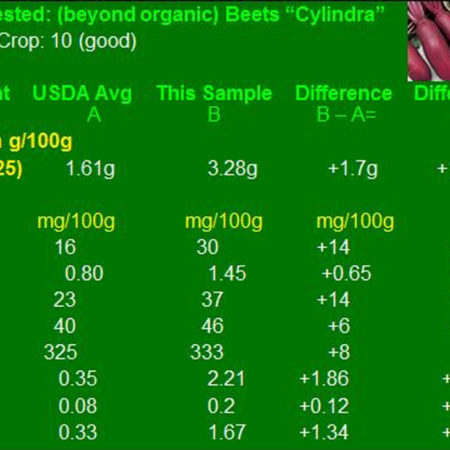 Some produce is being selected on the basis of phytonutrient density. And, yes, we have the technology to test for what the plants need to help them produce optimally. The resulting plants produce huge yields of wonderful tasting, Nutrient-RichTM food. Beyond that, some people have noticed that the produce has an incredibly long shelf life. Also, this is all accomplished in a very environmentally-friendly way. Now let’s take this produce (which tastes so good that children select it over junk food) and feed it to humans. What are the possibilities? We start with full-spectrum mineral nutrition. Not just the minerals you read about on One-A-Day® and Centrum® bottles, but also many trace elements such as vanadium and strontium—elements often overlooked, but important for optimal health. Vitamin and antioxidant content is also higher in Nutrient-RichTM foods. There are many components to food—thousands of phytonutrients—many of which act as antioxidants, or perform other functions in the body such as assisting with cellular communication. The production of healthful and flavorful food compounds is maximized by the careful process of growing Nutrient-RichTM foods. One interesting phenomenon shown in field reports and preliminary data is a difference in blood glucose response to fruits grown under the varying cultivation techniques. The fruits from the nutrient-balanced system showed a much flatter glucose response curve than the same cultivar of conventional fruits, which displayed the typical rapid glucose spiking and subsequent fall to a below-baseline hypoglycemic reading. The implications are especially important for people with diabetes and weight problems. One long-time researcher in the field feels that 70% of diseases could be prevented by regular consumption of nutrient-balanced foods. This is an emerging field, ripe with possibilities! However, the research has only just begun. Funding of detailed, controlled research is needed to move Nutrient-RichTM foods forward into the mainstream so that millions of people and our environment will benefit. http://beyondorganicresearch.com/wp-content/uploads/2017/06/bor-logo.jpg 0 0 Dr. Jana Bogs http://beyondorganicresearch.com/wp-content/uploads/2017/06/bor-logo.jpg Dr. Jana Bogs2010-09-22 12:11:482014-09-26 19:51:12What Is Nutrient-Rich(TM) Produce? Can the Food you eat Affect your Intuition, Dreams and other Energetic Experiences? Having a Doctor of Philosophy degree should allow one the philosophize (to speculate or theorize) on subjects related to one’s degree, in my case Horticulture and Food Science (with prior training in Nutrition). This may seem to be moving away from my typical scientific approach to problems, but I believe that great things can come from “thinking outside of the box”. The pineal gland is is thought by some to be the “seat of spiritual consciousness”. It is associated with the “third eye”. The pineal gland is also known as the epiphysis. Perhaps this is hinting at something important. 4. a literary work or section of a work presenting, usually symbolically, such a moment of revelation and insight. Perhaps one experiences more epiphanies when one’s epiphysis is working optimally. Such is taught by David Wilcock and others. As people age their pineal glands tend to calcify—as do some other soft tissues in the body. This may decrease functionality. It seems that people dream less as they age, and general cognitive ability declines. Are there certain nutrients that may impact pineal gland functionality? David Wolfe, among others, has explored the use of calcium supplements claiming that they cause calcification of soft tissue, such as the pineal gland. This is thought to be due in part to nanobacterial contamination in the calcium sources. Certain forms of calcium, such as calcium phosphates, may prove more hazardous than others. Unfortunately, I see various forms of calcium phosphates (i.e. monocalcium phosphate, dicalcium phosphate, tricalcium phosphate) added to many food products, such as nutritional bars, as well mineral supplements. Calcium carbonate is another form of calcium often seen in food products, such as soy milk. Obtaining calcium from food sources, not mined rocks, is the way nature intended for us to be nourished. Getting enough calcium from the diet is possible if one consumes high quality foods and is careful to maintain the appropriate pH balance by consuming predominately alkaline-forming foods (typically vegetables and fruit). Adequate magnesium intake plays a large role in proper calcium utilization and bone tissue building in the body. Typical recommendations call for twice as much calcium consumption as magnesium, but some researchers have found the ideal ratio to be the opposite—twice as much magnesium as calcium. I have personally witnessed osteoporotic patients consuming 1500mg of calcium in the form of supplements per day and still experiencing further degradation of their condition. What are good sources of magnesium? Green vegetables in particular. There is a magnesium ion at the center of each chlorophyll molecule. Obtaining adequate magnesium is reported to help prevent and reverse calcification of soft tissue. Organic sulfur in the form of MSM (methyl sulfonyl methane) also appears to be helpful in decreasing soft tissue calcification. MSM occurs naturally in foods and is well utilized. MSM powder has a mild flavor and is easily consumed mixed in water. Many users report relief from pain and inflammation. The sulfur-containing vegetables such as cabbage, broccoli and cauliflower should be good sources especially if grown on sulfur-rich soil and eaten fresh. Silicon is another element which appears to be helpful in getting calcium to the bones and teeth while keeping it out of the soft tissues. Silicon is available in fruits, vegetables and nuts grown on silicon-rich soils. Watermelons are typically grown on sandy, silicon-rich soil. Springtime horsetail herb is a favorite silicon supplement. Strontium and boron also deserve mention here as important for bone growth and maintenance, as well as other functions in the body. Vegetables should also be a rich source of these minerals, if they are grown well in soils rich in these elements. http://beyondorganicresearch.com/wp-content/uploads/2017/06/bor-logo.jpg 0 0 Dr. Jana Bogs http://beyondorganicresearch.com/wp-content/uploads/2017/06/bor-logo.jpg Dr. Jana Bogs2010-09-22 11:11:432014-09-26 19:52:18Can the Food you eat Affect your Intuition, Dreams and other Energetic Experiences? I have been interested in health and fitness since I was young, so I decided to become a nutritionist. After working in that field for a while, I realized that our foods are not as nutritious as they once were (there are several scientific studies proving this). 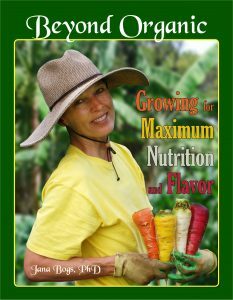 Always being one to optimize, I decided to “go back to the dirt” and learn how to “create health from the soil up”. My thought is–“Perfect Soil, Perfect Food, Perfect Health”. I term my research “Going Beyond Organic to Nutrient-Rich”. How does this relate to weight loss? My theory is that if the body is ideally nourished, it will be able to function optimally. We will feel great and not crave excessive food because we are nourished! http://beyondorganicresearch.com/wp-content/uploads/2017/06/bor-logo.jpg 0 0 Dr. Jana Bogs http://beyondorganicresearch.com/wp-content/uploads/2017/06/bor-logo.jpg Dr. Jana Bogs2010-09-22 11:11:152014-09-26 19:53:54Can Nutrient-Rich Foods Influence Weight Loss? Every nutritional products company needs truly innovative products that make real differences in people’s lives. Nutrient-Rich Foods are what will take nutrition to the next level for improving human health and longevity. Agricultural practices have resulted in a decrease of nutrient density in foods. There has also been a concomitant increase in toxic chemical content, not only from agricultural chemicals, but also from poor plant metabolism which may result in harmful constituents such as mycotoxins. As a clinical nutritionist I became keenly aware of these problems. This ignited my passion to “create health from the soil up”. To accomplish this I delved into how soil science, horticulture, and food science affect human and animal nutrition. I am well educated in and out of universities. I was spurred to get a PhD in Horticulture and Food Science & Safety to become a research scientist and consultant. I explore the cutting edge of what is possible in nutrition, for example, examining the differences in blood glucose response from fruits grown under varying cultivation systems. Optimal cultivation systems produce healthy plants which produce healthy humans and animals. I focus on techniques which help plants to fully express their genetic capacity. Careful growing practices which allow for full genetic expression may result in production of plant tissue compounds with extraordinary human health benefits. I term this “Going Beyond Organic to Nutrient-Rich”. Nutrients which are “life-complexed” by plants may be better utilized at the cellular level. For example, mined calcium products may contribute to calcification of soft tissue—aging(! ), whereas calcium complexed through plant metabolism may be properly utilized by the body. 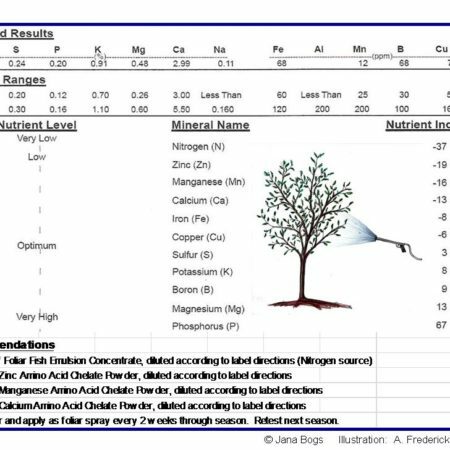 Furthermore, a larger percentage of the nutrients in plants grown in optimally-balanced soil versus poorly-balanced soil may be incorporated into body tissue as opposed to being excreted. Beyond the resulting full-spectrum, balanced nutrition, additional benefits include improved flavor and greatly extended shelf life. With proper growing techniques, plant pest and disease pressure are naturally decreased without the use of toxic chemicals, which then results in a cleaner environment. So it is truly a win-win-win-win situation for all concerned—the food producer, the marketer, the consumer and the environment. I believe it is possible for our world to sustainably produce high quality food which supports all life physically, mentally, emotionally and spiritually. With the advent of the continually growing market awareness of the value of organic nutritional products, the time has come for the next step—“Beyond Organic” foods and supplements. Some farmers understand how to grow “Beyond Organic” foods, but they need a better marketing system. I will enjoy working to procure these authentic “Beyond Organic” ingredients and, together with a team, perform analytical and clinical trials to further establish their efficacy. We will then use these superior ingredients to create supreme quality, nutrient-rich products with which we will create the next wave in the nutrition world marketplace. My broad background in agriculture and nutrition, including sales, marketing, clinical work, and R&D have given me the expertise and connections to make this happen. I still need a great team and funding to make it happen. If you, or some people you know, are interested in being part of this exciting ride, I look forward to speaking with you on how we may work together.